New Dental Choice is a comprehensive dental savings plan designed by practicing dentists for individuals, families, and groups of all sizes. In addition to their site redesign (coming soon), we had the opportunity to help them with some internet marketing, specifically a PPC campaign designed to capture a name, phone number, zip code, and email address; everything needed to follow up with a potential new customer. Targeted landing pages such as this are great for supporting PPC campaigns in addition to search engine marketing, ad networks, email newsletters, and affiliate marketing. 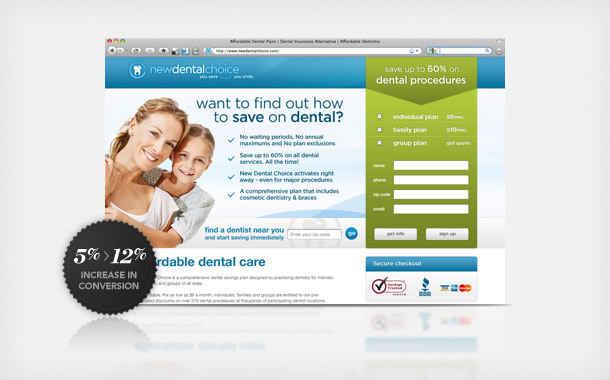 Through the use of proven, visual design elements and additional on page marketing strategies, we were able to increase New Dental Choice’s landing page conversion rate from 5% to 12%. Previous PostWhat Are Your Conversion Goals? where can I get a LCP like this to market my discount dental services?